This was a fun, and slightly scary, experiment to do with my preschooler! I filled two balloons, one with air, and one with some water and the rest air, to as close to the same volume as possible. My preschooler then helped me light two (nearly) identical candles…and then he was in charge of the camera. I made him sit a safe distance away from the experiment! I held the balloons at an equal height above the candles and waited. 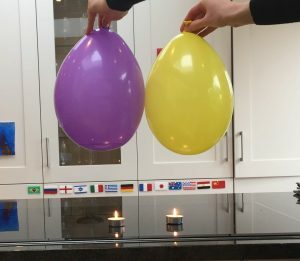 It wasn’t long before the balloon with just air in popped and caused the candles to go out. It was quite explosive, and my preschooler thought it was brilliant! The one with water in didn’t pop. We did this a couple of times as my preschooler thought it was so amazing. We then talked about the science behind it. The candles provided a heat source under the balloons. This causes the rubber of the balloons to get hot, and when sufficiently hot it weakens and breaks causing the balloon to pop. In the balloon that contains water, the water molecules absorb most of the heat so the rubber doesn’t get as hot. It takes a lot of energy to break the bonds that holds water molecules together, so water takes a long time to get hot. Therefore the balloon that contains only air pops much quicker than the one that contains some water. This looks like a lot of fun. I think I would need crowd control with my bunch! I shall put it on the list! My eldest was asking for it again and again…though I admit I did it when my youngest was asleep as I was worried he wouldn’t understand about not going too close! Hope you have fun with it! Previous story Fun with numbers 0-25!